The next Latvian national election will be on October 6th, 2018. Polling stations will be set up in Latvia and also in Latvian centres throughout the world. Latvia is a democratic country, each citizen has the right to vote in the elections. 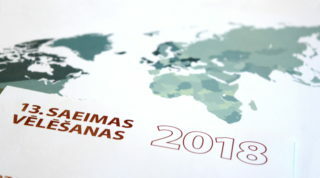 In contrast to countries with separate parliamentary and presidential elections, Latvia has only one national election, which determines the course of government for the next four years. The Latvian national election decides which candidates and parties will form the next government (Saeima). The elected Saeima chooses the President. The Latvian voting system is unique and the list of candidates and parties long. It is very important to vote, as the overseas Latvian votes form a substantial part of the electorate. In Latvia, where voting is not compulsory, each vote makes can make a big difference! There are 100 seats in the Saeima and 5 electoral regions, each region has a number of seats proportional to the population of that region. The regions are Latgale, Kurzeme, Vidzeme, Zemgale and Riga. Changes in population distribution result in a redistribution of the seats for each electoral region. For the upcoming election, the numbers are: Latgale (14), Kurzeme (12), Vidzeme (25), Zemgale (14), Riga (35). Since the previous elections, the first three regions have each lost one seat while Riga has gained 3. This change can be explained by the fact that the votes of Latvians living overseas are included in the Riga electorate and there has been a wave of economic emigration over the past four years. It has been calculated that overseas Latvians have the potential to decide 8 of the 100 seats. This can make a critical contribution to the formation and tone of the next government of Latvia. The voting system is based on party preferences. There is a separate ballot paper for each party. Each voter is given a voting envelope and multiple ballot papers, one for each of the participating parties. The voter chooses one of the ballot papers, which is then put in the envelope and into the ballot box. The remaining ballot papers are discarded. Before placing the chosen ballot paper into the envelope & ballot box, the voter can mark it to indicate preferences amongst the listed candidates, this will influence whether a specific candidate on the party preference sheet actually winds up with a seat in the Saeima. A plus sign next to the candidate’s name indicates a positive shift for that candidate, a line through the candidate’s name moves that candidate down the list. The ones at the top of the list get into the Saeima. There are many small political parties in Latvia. To be included in the election, a party must have at least 500 members and have been formed 1 year before the date of the election. To get into the Saeima, a political party has to poll at least 5% of the vote. To increase the chances of a small party’s candidates gaining seats in the Saeima, they often combine with another small party (or parties). When this happens, and a combined party is formed, it is useful to know the policies and actions of its constituent parties, before making a decision. The line-up of candidates for the election will be finalised in late July. Here follows a brief outline of the major parties. It is most likely that the major players in the next Latvian election will be three parties which already have a track record. These are: the social democrat “Saskaņa”, “Zaļo un Zemnieku Savienība” [ZZS] (Greens and Farmers Union) and “Nacionālā Apvienība” (National Union). “Saskaņa” has held the largest number of seats in the Saeima since 2010, but has not been part of the government. The main support base of “Saskaņa” is the Russian-speaking population of Latvia, but it also gains votes from ethnic Latvians. “Saskaņa” is ideologically different to all the other parties in that it is against Latvian being the official language of Latvia, it has a pro-Soviet stance on the Soviet occupation of Latvia and has pro-Russian geo-political leanings. Due to these basic ideological differences, it is highly unlikely that “Saskaņa” would be able to form an alliance with any of the other parties, so it is most likely they will again be in the opposition in the 13th Saeima. Zaļo un Zemnieku Savienība (ZZS) is currently the leading party in the Latvian government. It has its roots in regional areas outside Riga and many of its candidates are local government politicians. This party does not have a specific ideological base, but relies on the post-Soviet longing for a “good, honest manager” and also has the capacity to attract popular candidates. As the leading political party in the current government, it has been responsible for initiating the recent taxation and health care reforms. Although some of its members flirt with anti-Western and anti-American rhetoric, it is unlikely that it would form a coalition with “Saskaņa”. The support base for Nacionālā Apvienība is those for whom the Latvian-Russian relationship is of utmost importance. NA boasts a string of popular politicians and its supporters seem unconcerned at the increasing number of allegations of corruption levelled at their representatives. “Vienotība” gained second place in the previous election, but has now dropped to 3-4% in the ratings, so could possibly be completely out of the next government. This ratings drop can be explained by the party’s inability to overcome its internal differences. It has lost a swathe of politicians, but has retained a number of experienced and popular candidates who bring with them a solid support base. The policies of “Vienotība” are European, centric and technocratic. There is no guarantee that they will have enough support to gain seats in the next Saeima. “Jaunā Konservatīvā partija” has much in common with “Vienotība”. Its current focus is anti-corruption, which it is pursuing effectively. JKP is not a new party, but has been re-vitalised by fresh and energetic candidates, including human rights workers. Despite their energy and excellent communications skills, they lack political experience. “Attīstībai/Par” is a new party, hoping to attract “Vienotības” liberal electorate. It is led by competent politicians, with experience in government. It is supported predominantly by young, educated, European-oriented voters. The weaknesses of this party is that some of its politicians are tainted by previous public dealings and that Western left-leaning policies are not widely popular in Latvia. KPV.LV is basically a one-man party, led by Artuss Kaimiņš. He has based his political career on pointing out the failings of the existing elite and system, but is yet to provide alternative policies to deal with these failings. Latvijas Reģionu apvienība (Latvian Regional Union) is an independent ZZS look-alike, which has also attracted some interesting candidates. Latvijas Krievu savienība (Latvian Russian Union) is an openly pro-Moscow party, which attracts the radical pro-Russian sector of the electorate. This party sees “Saskaņa” as being too Western and conformist. From information compiled by Ivars Ījabs, an independent political analyst commissioned by PBLA.